We've got lots of branches down in the yard and we lost power for a couple hours as Hurricane Irene swept through New England yesterday. 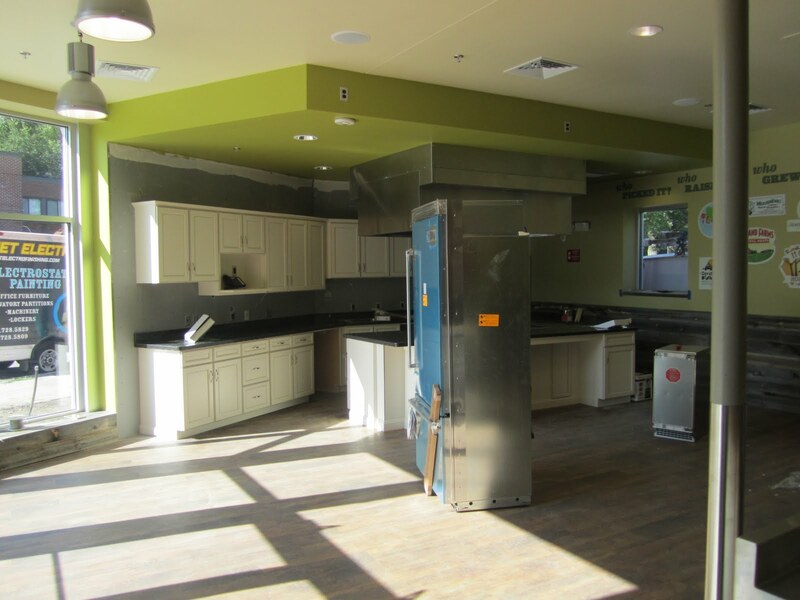 The Wellesley Municipal Light Plant quickly restored power. They're the best in the country - I'm 99+ points on them. Although there was some significant damage in other areas it looks like the hurricane wasn't as devastating as some feared it might be. I'm grateful for that and hope you and your family are safe. It's been a few months since Wine Spectator dropped a big 94 point rating on the 2008 Robert Mondavi Oakville Cabernet. With a $45 release price and relative high 7,700 case production this wine becomes one to seek out - especially since discounters typically offer it for less than $35. The meat of the Robert Mondavi line-up consists of the Napa Valley Wines (~$24), District Wines (~$45), and the Reserve Wines ($135). I last checked in with the Oakville bottling in the 2005 vintage. I caught a case of it on what I thought was a really good price - around $25/bottle. I slowly made my way through that case, enjoying a bottle once a month. It was so enjoyable and consistent. Outstanding Napa Cab every time at a relatively affordable price point..
Spectator didn't rate the '05 Oakville and neither did The Wine Advocate. Advocate rated the '08 Oakville just 89+ points so this is a wine Spectator really liked and Advocate thought was so-so. 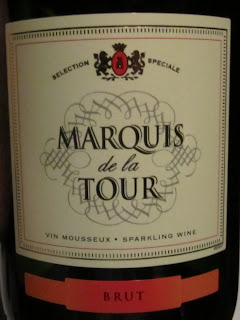 Some have suggested this wine as a candidate for Wine Spectator's wine of the year. I think the rating is a little low to take the top spot (they seem to go for wines rated 95 or better) but I wouldn't be surprised to see it in the Top 10. We shall see. Although the '08 Oakville has been out for while I haven't seen it in Massachusetts yet. The Costco in Waltham still has the '07 for $29.99. I get the feeling the distributor may be trying to clear out the '07s before releasing the '08s. I spotted the '08 for $39.99 in New Hampshire. Not the greatest price in the world but I thought it would be interesting to get a handle on whether it was worth seeking out more. I opened the bottle the same night I bought it. Is it one to back the truck up for? Not exactly, but it is made from 93% To Kalon fruit (pronounced "tow-kuh-lawn" - a famous vineyard that is 550 acres of Mondavi and 89 acres Beckstoffer which produces some of the most sought after wines in America). I'd recommend checking out a bottle or two if you're a fan of big Napa Cabs. This one is huge. A bold Napa Cab of great concentration and density that enters the room with a confident swagger. Complex aromas and flavors of rich blackberries, sweet spice, plums, and vanilla beans. A little overpowering at points (15.5% alcohol) but with adequate aeration this comes together nicely. Would like to check in again in a year but for now I'd be in for 1-3 bottles of this at a target price of $30-$33. Comes off a bit brash at first but with some time it settles down and becomes quite enjoyable. Black currant, plum, acidity, tannins - all the classic Napa markers are here. Hard to imagine someone feeling shorted with this one south of $20. 15.0% alcohol and it shows early on. Sometimes, it doesn't take a lot of research to find outstanding wines at reasonable price points. The Robert Mondavi wines present tremendous value year in and year out. For example the 2006 Reserve Cab was one of the best wines I've ever tasted and can be had for around $80 if you shop around. 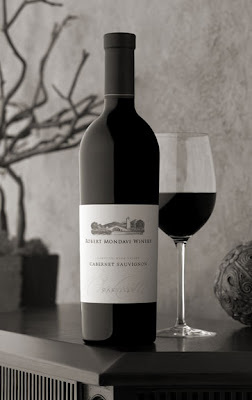 Question of the Day: Have you checked in on Robert Mondavi Cab lately? What do you think? The road to discovering new wine producers can take many directions. I usually have at least a dozen wines on my mental shopping list - a combination of recommendations from friends on Twitter, things I've read on blogs, tips from friends in real life, offers from retailers, and favorable ratings from wine publications. It typically takes months for me to hear a recommendation, seek a wine out, procure it, taste it, and write something up about. But I recently discovered a wine and completed the whole cycle in just a week. To kick off Restaurant Week Boston we visited Sorellina. It was our first time there and I thought it was fantastic: Elegant & serene but with a lively atmosphere. Impeccable service. Outstanding food. 4.5/5 stars. Enjoyed it very much. That said, the mark-up on the wine was pretty aggressive. The table next to us ordered a $140 bottle of Groth Cabernet that's readily available at retail for $39.99. I think I've even seen it for $34.99. $210 for a bottle of '07 Orenellia...too bad it was a half bottle. But restaurants almost always use wine as a profit center - nothing new there. I chose to go the by-the-glass route. I probably should have gone with something from Italy (Sorellina is a modern Italian restaurant) but I just wanted to enjoy some wine with whatever I might order. 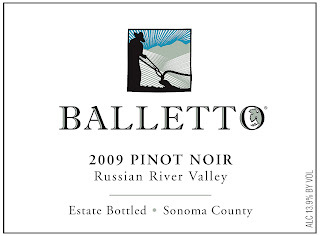 I went for a glass of 2009 Balletto Pinot Noir for $14. In the context of the tranquil environment, beautiful stemware, and ideal serving temperature I thoroughly enjoyed the wine. I took note of the producer and thought to check whether I could track it down at retail. I did a search on Wine-Searcher.com (the gold standard for finding wine online) and it turned up a retailer who said they had it for less than $20. That's the good news. The bad news it was only available at Select Liquors - a retailer I've had bad luck with. I've tried ordering wines from them at least a couple other times and they've never fulfilled for one reason or another. However, after a couple days I received an email saying my wine was ready for pick-up. Select Liquors is situated within Bazaar on Cambridge - a funky but evidently well-regarded (according to Yelp reviews) Russian grocery in Allston. I had a hard time finding someone who spoke English to direct me to where I could get my wine. I showed my ID at the register and that was that. I got my 2 bottles of Balletto and I was on my way. Drinking it later that night during family pizza night (Old School this week for those keeping score) something occurred to me. The atmosphere in which I tasted the wine the first time couldn't have been much more different. And I have to say - although it was still outstanding the second time I did like it more the first. In many ways a bottle of wine is a commodity. The effort that goes into preparing it in a restaurant pales in comparison to the Lobster Gnocchi we had at Sorelina (which was amazing by the way). But when you factor in the overall experience and the resulting discovery of great wines that can occur it's a bit easier to swallow the high markups we see in restaurants. Rich but not overripe. Black cherry and cola notes. A little rough around the edges (mildly astringent, which may improve with time) but there's so much right here it's hard not to love. Really nice wine. What's your strategy for dealing with overpriced wine in restaurants? 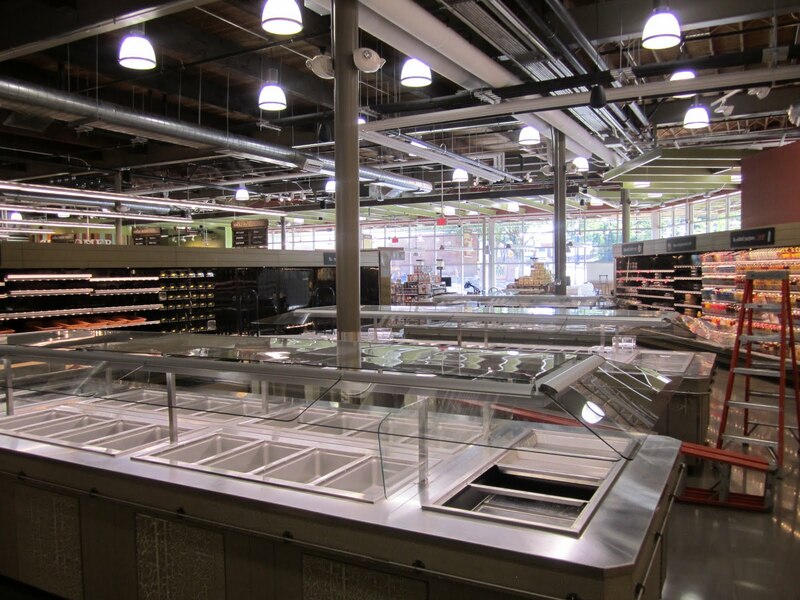 Whole Foods Market is set to open its new location in Wellesley on Monday - just one day after closing their 5,900 square foot location at 278 Washington St that's been open since 1980. 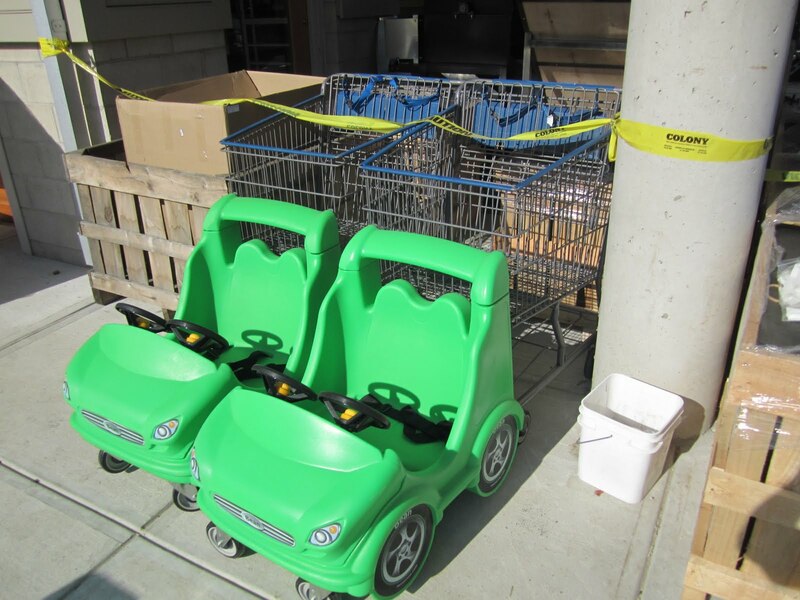 The new store will offer 26,000 square feet of grocery goodness and perhaps more importantly, over 200 parking spaces. 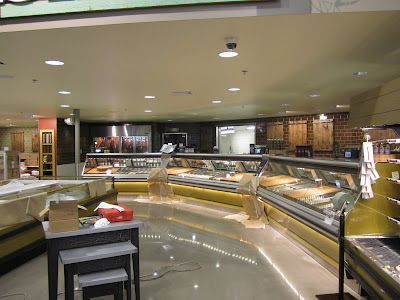 After touring the new location as finishing touches were being applied this week I have a feeling Whole Foods loyalists will be pleased with the new location. And the store will likely attract shoppers who previously shopped primarily at conventional grocery stores. More on this in a moment, but first a little background about Whole Foods. 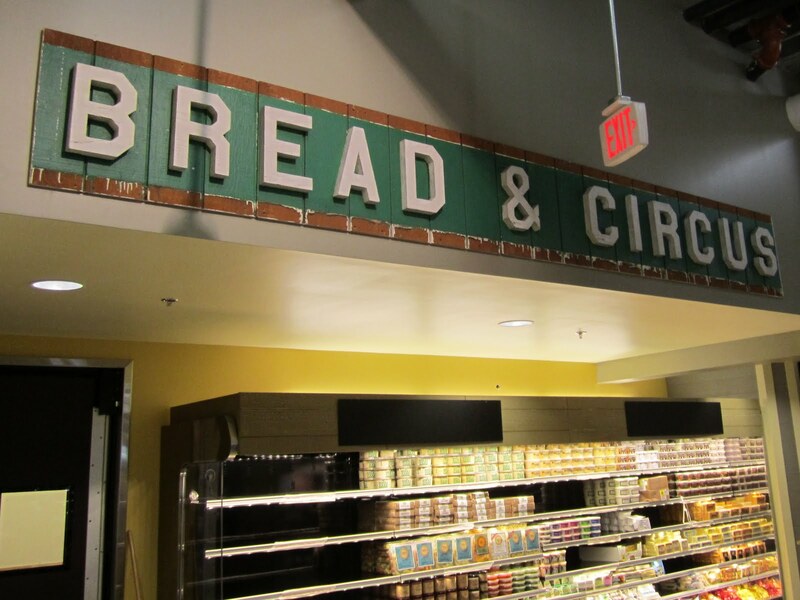 The first Bread & Circus opened in Brookline in 1975. 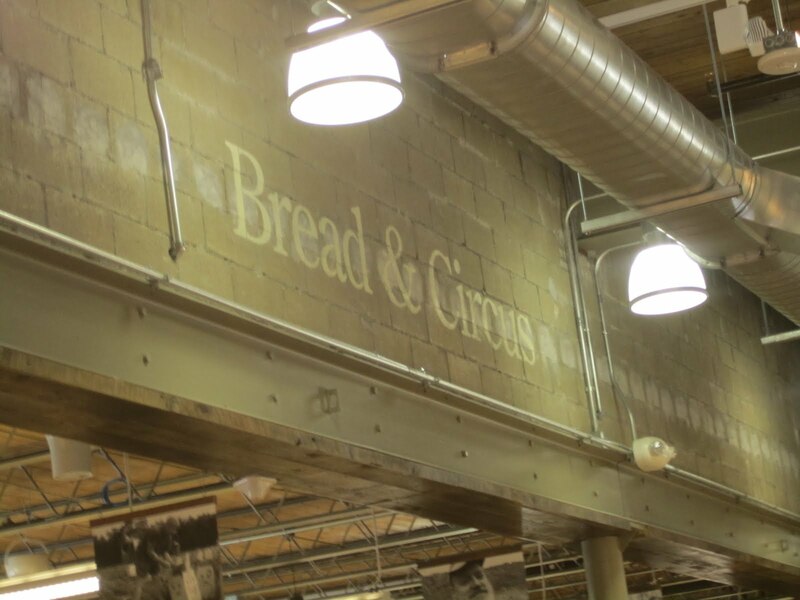 The Wellesley location opened in 1980 and over the years a total of six Bread & Circus stores operated in the region. They were somewhat similar to green line T stations in that they were situated in little pockets in neighborhoods as friendly little markets. Whole Foods is Hot, Wild Oats a Dud -- So Said "Rahodeb"
From around 2000 to 2005 I was a Whole Foods shareholder. I liked to invest in companies I was impressed with and each time I visited a Whole Foods location I saw long checkout lines and outstanding overall execution. Kind of like Chipotle these days. Yahoo! Finance message boards were big at that time and I remember being impressed with the postings of one the forum's consistent contributors, "rahodeb". Rahodeb would bust out compound annual growth rate statistics (CAGR) and familiarity with Whole Foods expansion plans with incredible clarity and accuracy. Here's an example of a typical posting - someone should really compile these into a book. When someone would question whether Wal-Mart's expansion into organics would threaten Whole Foods, Rahodeb would fire back that it was instead Wal-Mart that should be concerned about Whole Foods. Rahodeb would spar just enough with "liberfar" and "hog152" to make you think they were a regular message board nut job meanwhile planting seeds of doubt if you should be so foolish as to short Whole Foods stock. It turned out Rahodeb was none other than Whole Foods CEO John Mackey. Rahodeb was an anagram for his wife Deborah. Looking back I'm glad Mackey's identity was revealed. I'd developed an inferiority complex over my inability to delve into the details of a company the way Rahodeb did and it actually made me feel better when I learned it was the CEO posting anonymously. The chart above shows the performance of Whole Foods Market stock (WFM) over the past 20 years. Their largest acquisition - of Wild Oats in 2007 - came right before a precipitous dip 2009. But the stock has bounced back remarkably well. Is it a good time to buy Whole Foods stock? I think it depends on their ability to continue growing - both in terms of same store sales and in terms of new locations. When viewed through this lens it becomes clear why they'd move to this new, larger location. How could they possibly eek any more dollars out of the old location? The place was bursting at the seams and had to be constantly restocked. When Wellesley-based Roche Bros moved to its snazzy new location across Linden Street, it demonstrated that a modern supermarket could indeed be shoehorned into landlocked Wellesley. I doubt Roche Bros had much direct impact on Whole Foods, but the disparity in spaciousness between the two stores become glaringly obvious. 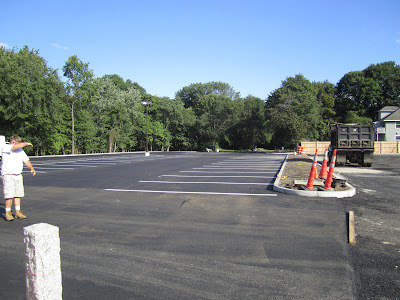 One would have to think Whole Foods real estate management had this in mind when the opportunity to move into the site formerly inhabited by Star Market presented itself. Star Market's departure was mostly unlamented (the situation with Tian Fu kicked up far more controversy) and by displacing another store there is one less grocery store in town. 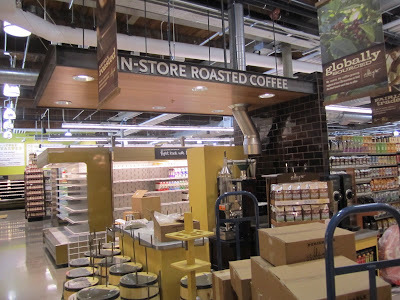 But I've always felt like Whole Foods main national competitor is Trader Joe's. With locations in Needham and Framingham Trader Joe's would make a lot of people happy by opening in the space Whole Foods will vacate. 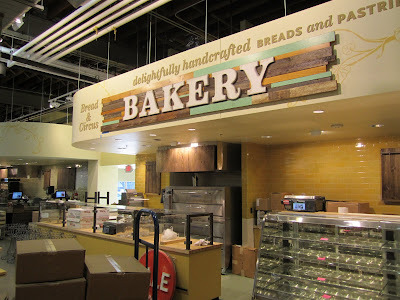 I've heard rumblings it may be just as likely to become a Panera Bread. Perhaps the real competitor hasn't arrived yet. 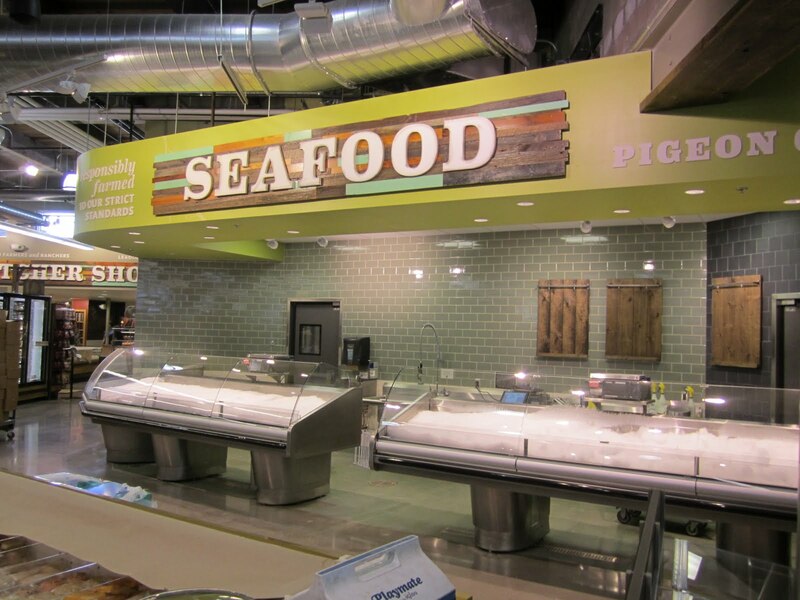 Rochester New York-based Wegman's regularly appears near the top of Fortune's Best Places to Work list and is planning to open in Northborough, MA in October with rumors of additional stores in Westwood and Burlington over the next couple years. I've always felt Whole Foods was uniquely positioned. 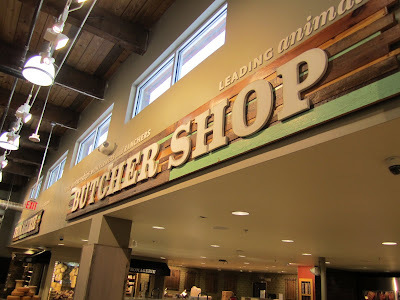 Yes they have a lot of organic and natural foods but they sell food that's flat out delicious while maintaining standards I haven't seen other grocery stores come near matching. They've always said "It's about Whole Foods, not Holy Foods" (link). Some might say it's more like "Whole Paycheck" but in my experience if you like the product assortment at Whole Foods their prices are as good or better than other stores. Just behind the produce is the seafood section - soon to be stocked with fresh catches from Pigeon Cove. Behind Seafood is the Butcher Shop. 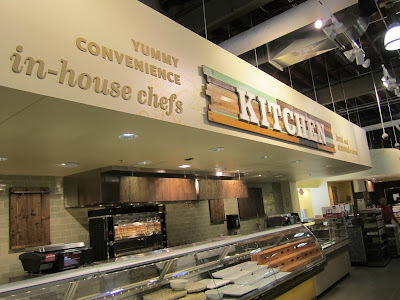 I learned that the unique signage you see in Whole Foods locations are custom made for each location. The location mixes rough-sawn signage with polished concrete floors. Very cool. 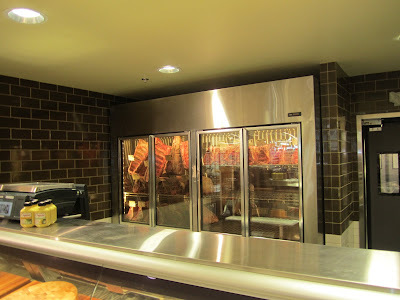 Dry aged steaks make their first appearance at a Whole Foods in Wellesley. The cheese section is large as a percentage of the square footage of the store. 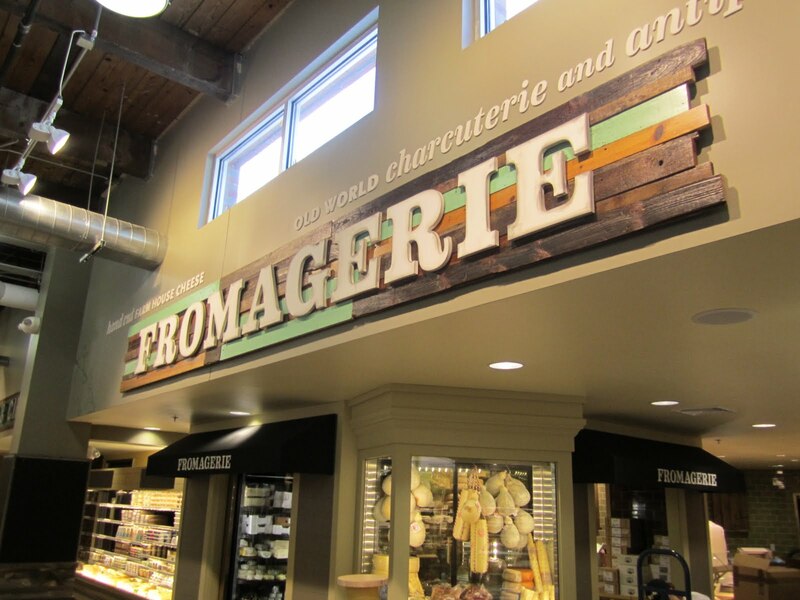 It offers a combination of pre-packaged and hand-cut gourmet cheeses in an alcove similar to one at their Dedham location. Baked breads are available as well as fresh-made pizzas available by the slice or whole pie to take out. 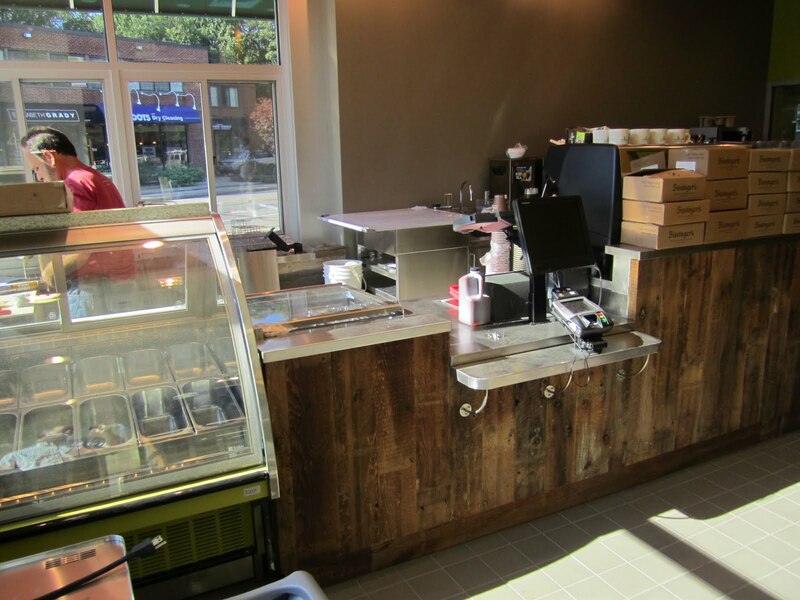 A special feature near the adjacent little league fields is a take-out counter offering refreshments, gelato and coffee. Taking advantage of the store's adjacent to the ballfield location. Nice. Whole Foods are starting to become more like restaurants than grocery stores. 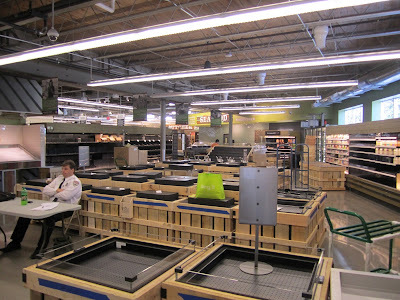 The prepared foods section is massive as a percentage of the store. I'm particularly looking forward to the burritos made to order...and the free Wi-Fi. The salad bar/hot foods section looks to be as large as those found in larger Whole Foods locations. Will The Old Location be Missed? 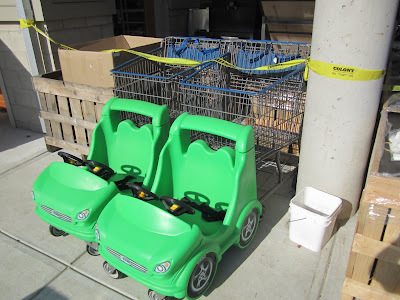 A small kids play area is near the registers and, I presume, where some tables are soon going to be for shoppers to eat prepared foods. 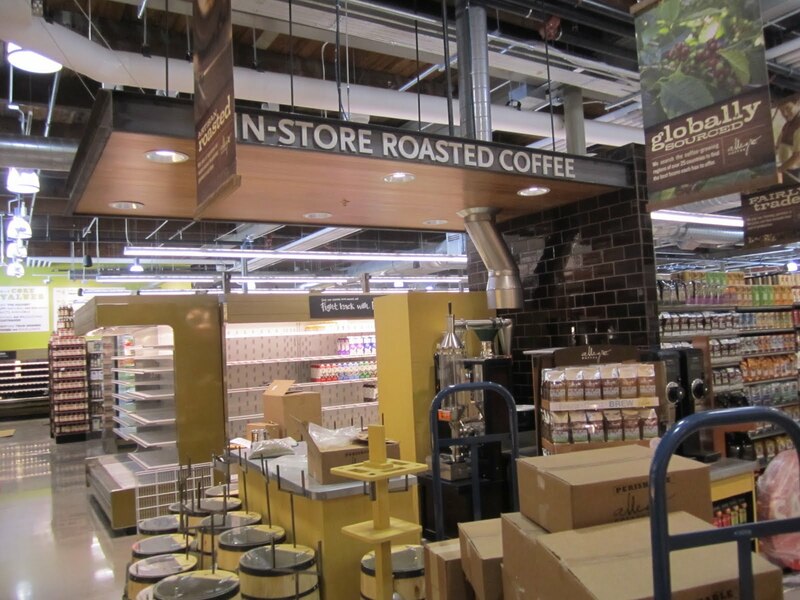 The opening of the Wellesley Whole Foods Market has been highly anticipated. I think people are really going to like it. 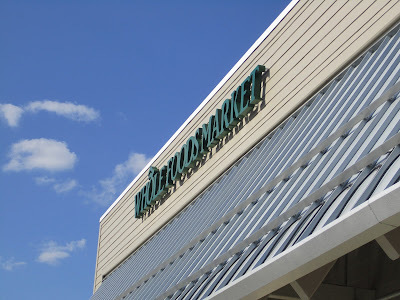 If you haven't shopped at Whole Foods in the past I'd encourage you to give it a try. As I toured the store I got the sense I'll enjoy shopping here with my family for years to come. It's a nice space they've created and I'm looking forward to seeing the store with its shelves fully stocked and staffed. 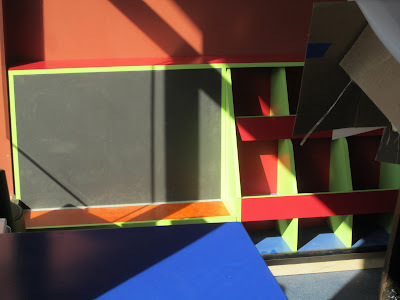 The store is offering a sneak preview this Friday, August 19th, 2011 from 8 am to 6 pm. Click here for more information. They're also holding a "bread breaking" ceremony at 7:30 am right before their 8:00 am grand opening on Monday August 22nd, 2011. The first 500 shoppers get a reusable Whole Foods shopping bag. More info on their website. Wellesley doesn't allow wine to be sold at retail. 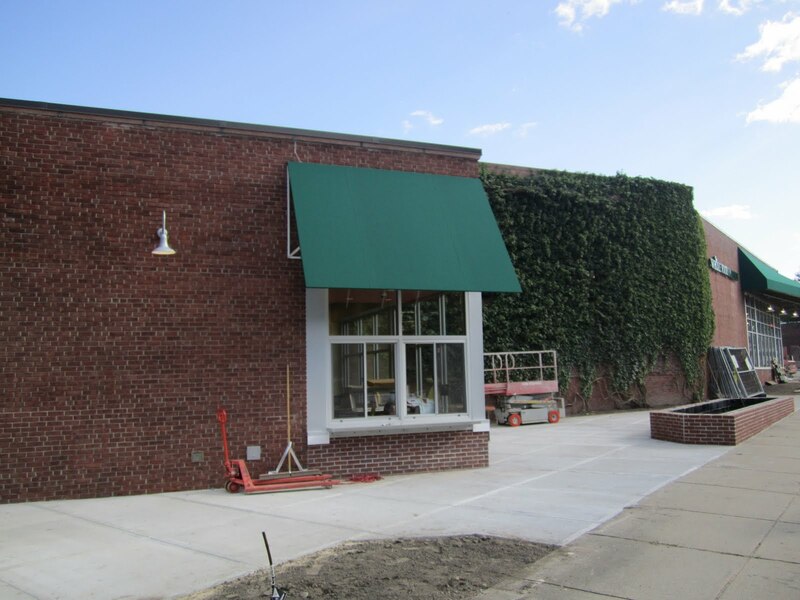 Even if the town did allow it, the state currently allows a maximum three liquor licenses per retailer. Check here for a list of grocery stores in MA that do sell wine. The winning streak continues around here for California Pinot Noir with the 2009 Failla Keefer Ranch Pinot Noir. I've been hearing good things about Failla (pronounced FAY-la) from a number of friends so when Wine Spectator dropped a big 95-point rating ("Classic") on this one the hunt was on. We were able to track some down before things got too out of hand and I'm pleased to report the wine delivered. Kind of like when Arizona Cardinals coach Dennis Green said the Bears "are who we thought they were" (http://www.youtube.com/watch?v=cDAq5tyfk9E). Well, maybe not just like that but the point I'm trying to make is I had high expectations and the wine delivered in a big way. Another one of these California Pinot Noirs that charms with it's fruit-forward aromatics and ultimately satisfies for how clean and free of "off" notes it is. Pure. Something for everyone I think, with aromas of tart cherries, orange oil, and soft leather. Well balanced. Silky smooth on the palate with a beautiful finish without any strange aftertastes. Fantastic stuff. 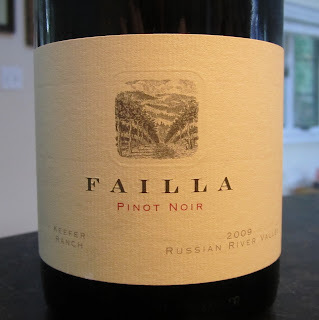 It might be hard to find this particular bottling but I'd definitely be interested in seeking out other Pinot Noirs from Failla. Especially the 2009s. I'm compiling some thoughts and tasting notes for 2008 Oregon Pinot Noir (what the heck happened to that vintage?) and 2009 California Pinot Noir. Especially if you're interested in domestic Pinot Noir I'd love it if you subscribed to the site so we can keep in touch. Question of the Day: Have you tasted Failla's wines? What did you think? What have you heard? 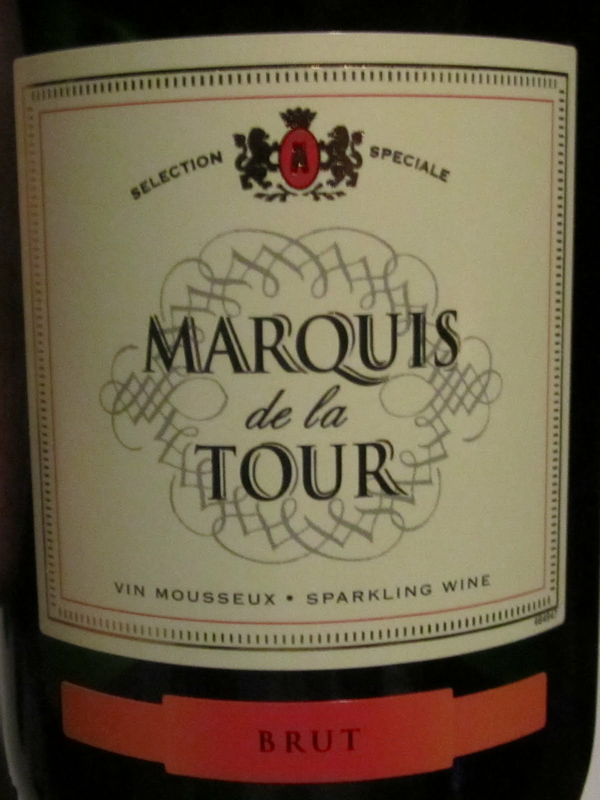 The evening started out with a taste of hors d'oeuvres accompanied by a white sparkling wine from the Loire Valley - the Marquis de la Tour Cremant de Loire Brut. I'm not much of a sparkling wine drinker so for me the wine set the tone for the event. The wines chosen provide an opportunity to taste delicious, high quality wines you'll enjoy from categories you don't normally explore alongside wines you're likely more familiar with. 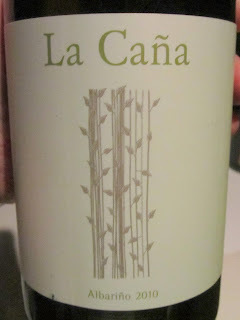 I thought this wine was outstanding - clean crisp apple, melon, and peach. It accompanied the food amazingly. Highly recommended. 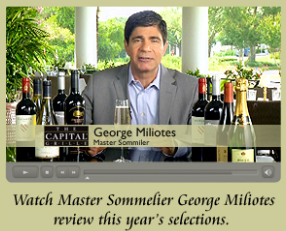 George Miliotes: "For me, it is all about wines that are well-made and taste good. As solid winemaking practices have spread around the globe, there is a greater pool of diverse and tasty wines to choose from. We love to find areas or wines that are overlooked or underappreciated. Hence, the Tarima Hill Monastrell is part of The Generous Pour Wine Event this year. Monastrell is the greatest underappreciated red in the world today from a growing area (Alicante) that is barely known in Spain, let alone here in the US. We feel privileged to introduce the wine to the U.S. while showing our guests something new and delicious." From there we moved on to a dining room table for a sit-down appetizer course. Their Pan-Fried Calimari and Prosciutto Wrapped Mozzarella were served with a classic California Chardonnay (Chateau St. Jean) alongside a 2010 La Cana Albarino from Rias Baixas Spain. We had a taste of the red wines recommended for pairing with entree courses for the event. The 2009 Byron Santa Barbara Pinot Noir was deep red with a full mouthfeel. A little spice. Very good. Lots of people at the table really liked the wine. 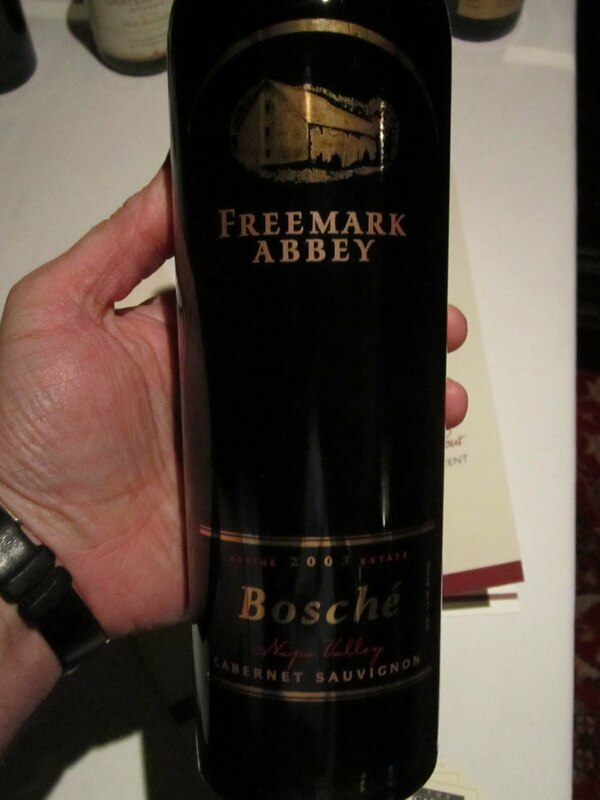 The big dogs - two Cabernet Sauvignons - were the 2006 Chalk Hill Estate Sonoma Cabernet Sauvignon and the 2003 Freemark Abbey Cabernet Bosche Rutherford (pronounced "bow-shea"). I thought the Chalk Hill was tasty but bright and a little young...especially compared to the 2003 Freemark Abbey which was a beautiful wine. At 8 years I thought the Freemark was drinking at its peak with rich, round fruit, a little leather and nice supporting structure. For pure enjoyment this was probably my wine of the night. WWP: You’ve run a similar event the past couple years in the form of the Master Wine Tasting Event. What have you learned from putting together those lists that went into the wines selected for The Generous Pour Wine Event? George Miliotes: "The main thing we learned is to have a fun mix of familiar and new wines that all taste really, really good. For example, we aim to keep a Cabernet drinker interested with Freemark Abbey Cabernet Bosche 2003, but also give that drinker a chance to break out and try a Vistorta Merlot 2006 (from the Friuli region of Italy). This way, every guest has the chance to experience the best of both worlds. The other exciting thing that we have learned is that guests will enjoy any wine that tastes good, especially if our team educates them about it. Two years ago, we introduced Bonarda (a popular red varietal in Argentina) to our guests. We were sure we would sell minimal amounts. To our surprise, that was not the case, as guests were more than excited about tasting this tannic red with our dry aged steaks. As a result, each year I try to find something completely new or different." Right behind these big reds were a couple of wines a little more off the beaten path. Like the 2006 Conte Brandolini Vistorta Merlot Friuli-Venezia Giulia. I thought it was distinctly old world yet still approachable. 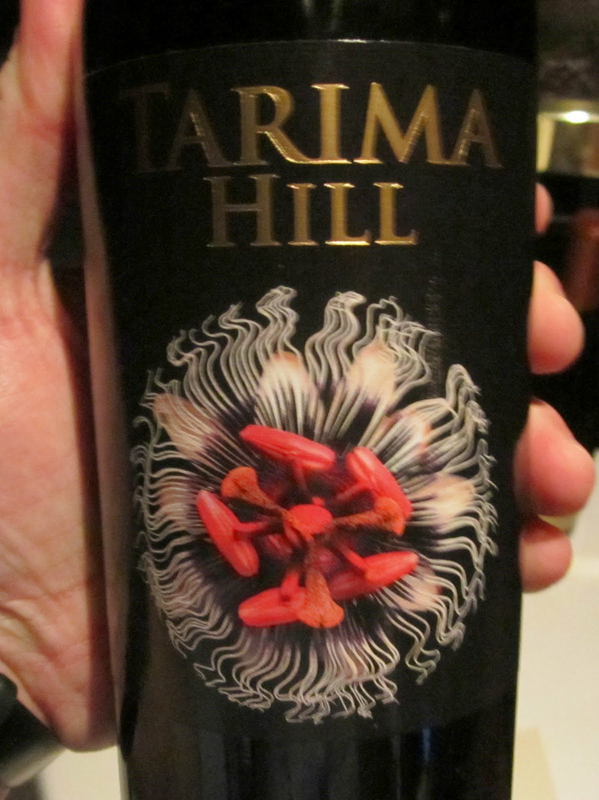 Perhaps the most highly anticipated wine of the evening, based on George's earlier description of Monastrell as being the most under-appreciated grape variety in the world, was the 2009 Tarima Hill Monastrell from Alicante, Spain. Refreshingly fruit-forward after the Cabernets. Kind of reminded me of the 2008 Betts & Scholl Grenache I tried at the Wine Spectator event a couple months ago. I definitely need to try more Monastrell and Grenache. The entrees were accompanied by Sauteed Spinach and Lobster Mac 'n Cheese. Every time I've been at a table where the Lobster Mac 'n Cheese was served it's the side that people seek out for seconds. It's ridiculously good. Rounding out the evening along with dessert was RL Buller "The Portly Gentleman" from Australia. I'm not much of a port guy but I liked the way this one avoided the medicinal flavors sometimes present in Port and offered an interesting does of blueberry flavors which I enjoyed. The table was divided on their opinion of this wine. I attended the event at the Capital Grille's Newbury Street location in Boston but this offer is available at locations across the country. WWP: The Capital Grille has locations all over the country. What differences do you see in red vs. white wine consumption across those locations seasonally? George Miliotes: "We certainly see red wine consumption go up when cold weather settles in, and there is a smaller movement towards white during the summer. 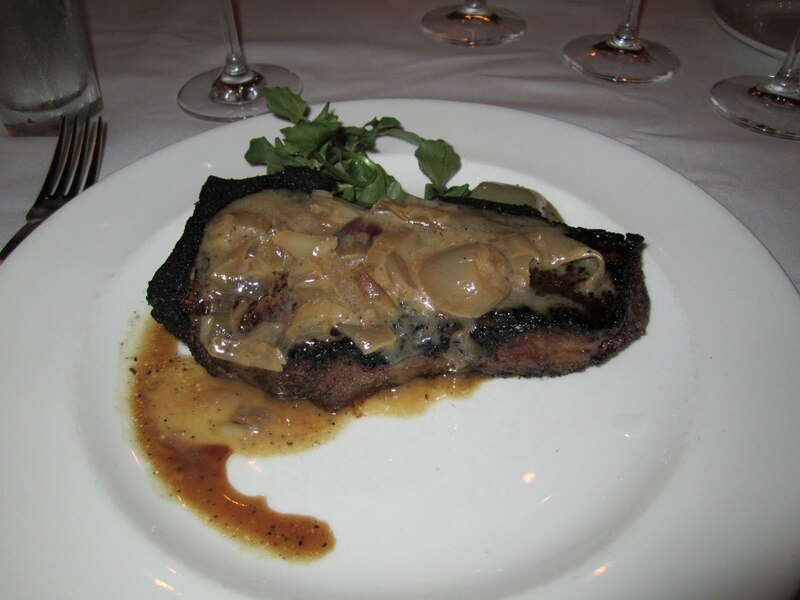 Our guests tend to gravitate towards reds, due to our dry aged steaks. As one would think, there is plenty of white enjoyed at our West Coast locations, due to the higher temperatures and light dishes such as our fresh seafood." Bottom Line: This event provides an opportunity to try wines you otherwise might not be willing to take a risk on at an affordable price point with excellent food and service. I mentioned that in Boston there are a couple of other events that coincide with this offer that make this year's Generous Pour even more compelling. The first is Boston Restaurant Week which runs August 14-19 and 21-26, 2011. According to http://www.restaurantweekboston.com the Chestnut Hill and Burlington locations are participating this year. Stack a three course meal for $33.11 along with this wine offer for $25 and you have one of the best bargains in steakhouse history. A second compelling event is that the Newbury Street location is relocating to a new location nearby (900 Boylston Street in the Hynes Convention Center not far from Towne Stove & Spirits) on August 24th, 2011. 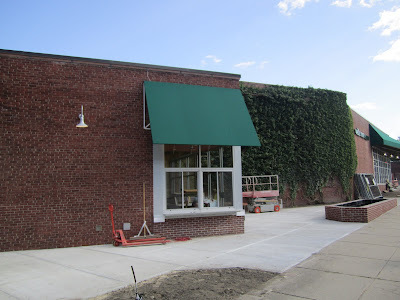 Having celebrated so many special occasions at the current location I'm sad to see it go, but the new decked-out location is going to be twice as big with a bar area that opens onto the street for warm summer evenings. Stay tuned for more information on the new location but in the mean time take this opportunity to visit the classic Newbury Street restaurant one last time. It will be missed. 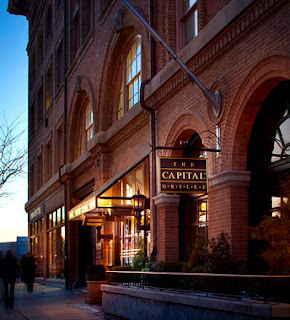 Question of the Day: What are some of your favorite Capital Grille memories? If you've never been, what are some of your favorite steakhouses in the country?